Never ever punish destructive behavior. 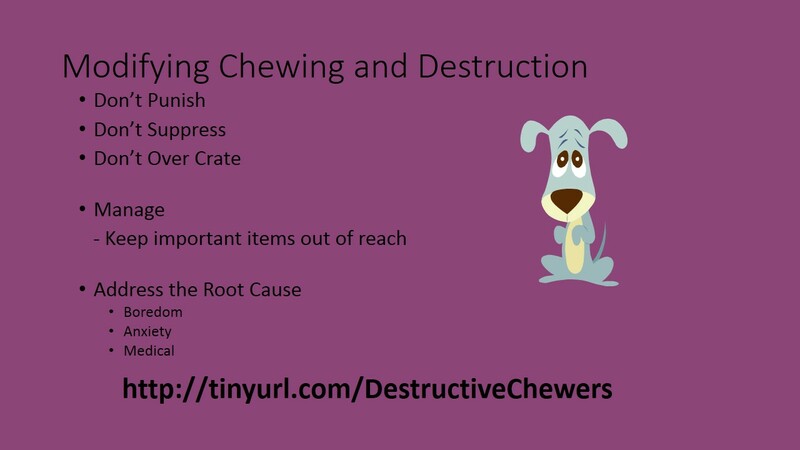 In most cases, this will make the behavior worse: Spot chews up your coffee table while you are work. You come home hours later to find the coffee table destroyed. You yell at spot. Spot has no idea what you are yelling about. All he knows is that you come home angry. The next time, he might be anxious about your impending arrival and he might cause more damage. If the destructive behavior is caused by separation anxiety, an anxious dog will try to escape. There are other hazards awaiting a dog who is left outside, alone for several hours at a time. Additionally, dogs are social animals. If they are left outside all the time, they will develop a myriad of other behavior problems. Dogs who spend too much time in crates can also develop behavior problems. Although crates can keep our dogs and our property safe, we don't want our dogs living their lives in crates. Sometimes taste deterrents work, sometimes they don't. What they definitely don't do is address the root cause. If a pup is chewing out of boredom and the only thing we do it slather bitter apple on everything, we haven't addressed the boredom. Maybe we've stopped the the dog from chewing on the coffee table leg, but we haven't fixed the boredom issue. When we don't fix the root issue, our dogs will just find another outlet. And your dog might choose something worse than chewing a coffee table leg. And what is really concerning about bitter apple is that a dog might be chewing because of a serious medical issue. If all we do is try to suppress without investigating, we might be ignoring something important that needs to be addressed. Additionally, in the time it takes to slather bitter apple on an item, we could have simply put the item away - out of reach. Until you figure how to properly and non aversively address the issue, you can mitigate damage by managing the behavior. Fifi can be crated or placed in a safe room when you are gone. (see videos below) Or look into hiring a trusted and reputable baby sitter to look in on your pets. Is Lucy fixated on only one thing - like the coffee table? Then sell the coffee table. Or put it in storage or move it to a room behind a closed door. For ideas on how to keep our things safe while not over crating, see Safe Room for Dogs Part I and see Safe Residence below. Pet parents might also consider the "umbilical cord" technique. Tether your dog to you. That way you know exactly what your dog is up to at all times. Don't do this if it causes stress to your dog. Think that doggie day care or a pet sitter is too expensive? Compare the cost of day care against paying for the things that Rover destroys. Consider that day care is just a temporary measure until the behavior is resolved. Write down the day's activities, foods eaten, etc.. See if any patterns emerge when you review the log and match it up with times of destructive behavior. Managing the behavior is only a temporary measure until you figure out the root cause of Darnells' destructive behavior. The best way to address an undesirable behavior in your pet is to first investigate the root cause of the behavior. So what are some reasons that a dog might become destructive? Be sure to use toys/chews that are size appropriate and dog safe. Better than the positive interrupter is to keep your dog from developing an undesirable habit. We can accomplish that by keeping our dogs busy and engaged or we can look for a "tell" and redirect our dogs before they start chewing. Separation anxiety is a common issue but it can be hard to address depending on the severity of the problem. Treating SA is another topic in and of itself. Here are some basic things you can do to help - especially if the SA is mild. Don't make a big deal out of coming and going. No long goodbyes, no giddy hellos. Sometimes an issue might appear to be behavior-related, but could have a medical component. 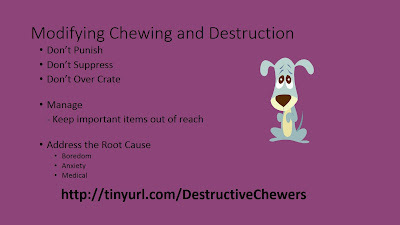 Some dog chew or lick things because of gastric issues.